Lately I've been in a little of a funk. Work has been a little stressful and there is the possibility of a major life change in the works. Fishing hasn't been my first priority. When life seems hectic it makes me want to fish even more. When I am fishing I don't think about anything but the current moment. The weather has cooled some and I wanted to get on the water. There is a pond close by that I have been fishing recently but it hasn't been very good. Really I wanted to be in a river. My closest choices are the Neuse and the Haw. Neither river has been very kind in the bass dept. I figured what the heck and decided to make a short trip to the Haw. The water level was perfect and it was very clear. I didn't see much fish activity but with in 5 min I had a decent largemouth on. It made the evening seem very promising. I hit various spots that I knew had to hold bass. I missed strikes here and there. I noticed some menacing clouds overhead and I knew rain was coming fast. My plan was to work the structure in a close area. I went about 10min with out any action what so ever. I had some bluegill playing with my fly but I never had anything of substantial size. This was my first time applying knowledge I was reluctant to use mostly because I didn't think of it myself. In the end the advice was right on and it paid off. What was the advice? Use big flies and think about edges. Usually when I went for large mouth I was using what I thought were big flies. Poppers size 10 or 8. I was told that is way too small. The size I needed to use was at least a 4 or 2. To me that seemed monstrous for a largemouth. After catching that first bass on a sneaky pete and looking at what I thought was a big fly in the fish's mouth I realized that sz4 fly wasn't so big. The clouds became more menacing but I continued to work edges and stayed at the edge of the storm. I had all the edgy advice put into action on a good spot. I made probably one of my best casts of the day, twitched the fly a couple times and heard the sweet sound of GULP! I could tell the fish was a pretty good size by how it bent my 8wt. When it jumped my heart really started racing. This was by far the biggest largemouth I had caught not only on the Haw but with a fly. It ran for some rocks and jumped few times showing me how dangerously close my sneaky pete was to coming out of its mouth. In the end the fish surrendered and I had my first good river bass. I played around with my video camera on this trip. I was lucky enough to get the whole thing on video. It's a few minutes in. The date in the beginning of the video is wrong. I was too lazy to change it. I'm one of those people who hates admitting I'm wrong and not the best at things. When it comes to fishing I never thought I was the greatest but I felt I at least kind of know what I'm doing. I came cross this blog called Biggerfish. At first I was like great here's another blog about some one who thinks they are a master fisherman. After reading this guys blog I found this guy doesn't just talk the talk he can indeed walk the walk. Every week it seems he has a story about catching huge trout. When I say huge trout I mean fish you would like to catch once in your lifetime. This guy does it weekly. You can make excuses all day long, like he has more time to fish, fishes locations with less pressure, is just lucky. Even if those were factors the guy still catches huge fish. Not only that but he can put his family on them too and get them to catch them as well. His kid at like 12 has already caught more big trout than I have in my lifetime. Humbling to say the least. I'd like to think I'm an ok writer. I'm no John Gierach but I find my stories somewhat entertaining, at least to me. Well Mike's blog, Mike's Gone Fishing takes it to a different level. His stories have that little extra I can't seem to dish out in my posts. His writing style is great at getting the details of a fishing experience as well as the soul. This last guy annoys me to no end. Not because he is a bad guy or writes offensive material. It's because he makes catching carp seem about as easy as catching gills in your local pond. Big carp too like ones you can rope and use for water skiing. John Montana catches these things like no other I have ever seen. I'm suprised he hasn't been asked to write the next Carp on a Fly book. When someone can paint well it's almost like having a super power. I just can't relate to being talented enough to look at something and express it back on paper. At least not legibly. Joel from A Year on Fly does it daily. The style of his water color paintings is like nothing I've seen before. It's neat to see the talent of a great painter make works of art for a hobby he loves. After a stressful work week I couldn't think of anything better than to get some time on the water. The theme was gonna be easy. 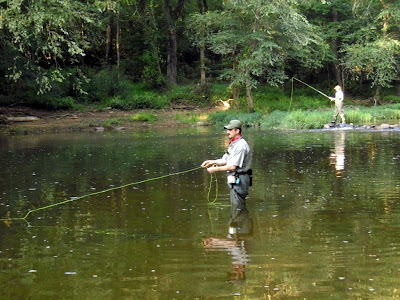 Simple wading, aggressive fish and scenic water. The Eno fit these requirements perfectly. I met up with some friends I hadn't fished with in awhile and we were on the water early. The water seemed cool for the air temperatures we've had lately. There hasn't been many days below 90 degrees in the last two months. There has been some rain lately and I can only assume that's what cooled the water. It seemed to be around 70degrees. The Eno is not only filled with sunfish but also these guys. They make you really look at where you are sticking your hand. 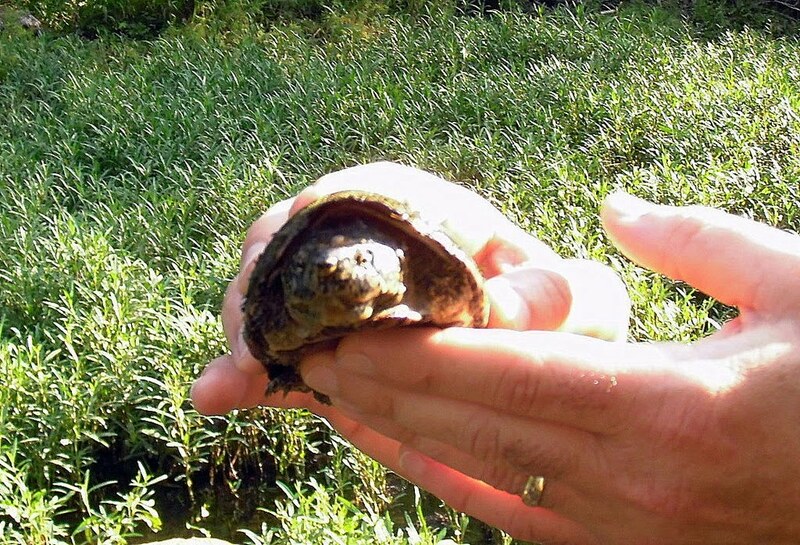 This was one of the smallest snapping turtles I've seen. The first hole we tried was a place that is normally productive. There's submerged roots and overhanging branches with a run providing oxygenated water that riffles into a deep pool. It's one of those spots you couldn't have made any better if you designed it yourself. Even with all of those features the fishing was pretty slow. We worked various sections and there were strikes here and there but we didn't see the usual ferocious eruption strikes sunfish provide. There wasn't even many follows or denials. I did have a surprise fishing a olive wooly bugger pattern through a pool. I had a nice tug on the line and I thought maybe this was my first Roanoke Bass. It wasn't meant to be and as the fish came close to the surface I saw the whiskers that can only signify a catfish. The coloring of the fish was pretty vibrant. Catfish are funny creatures. Mostly they are caught by accident while fly fishing. There isn't much of a technique to catching them. I almost always catch them on a dead drift. They don't hit particularly hard but they bull dog and stay on the bottom after they are hooked. The fishing picked up soon after the catfish. Most of the fish were caught on poppers. I don't really think the Eno can be beat for top water popper fishing. It's pretty difficult to not catch a sunfish if you work the banks with over hanging branches and cover. I messed around with the waterproof camera some more on this trip. I love the quality of the underwater video that it takes. The downside is it doesn't take great photographs. You have to hold perfectly still to get anything clear. The video here is of an average sunfish you catch on the Eno. Whenever I see the New River I get a little excited. The river is not that wide but it has a lot of features and looks like it could hold trophy fish around every bend. After checking out the campsite and cabins I made haste to get in the water. I'd felt warm water before but the river was like bath water. I didn't have a temperature gauge but I wouldn't be surprised if it was 80 degrees. The wading was pleasant but there was a lot of moss. This made fishing a little annoying. Moss that was dislodged up stream from other people swimming or playing in the water filled the surface and if it got on you line you had to stop and clean it off. You'd only get about two casts in before you were cleaning green sludge off your fly. People complain about didymo but this moss is horrible. I didn't catch any fish the first day. The next morning some friends and I recovered from the night before and headed out for a day float. We put in a few miles up stream and there wasn't the same moss that plagued the campground section. The flow of the river was low but decent. We were off in search of a lunker. My friend let me use his kayak and I was really lucky. With the low water I was still able to flow over the faster class 1 type sections. Others in the group had a float tube and I could only imagine how frustrating it would be to stand up walk with your tube then plop down back in the water. You would have to do that about 100 times on this float. The fishing seemed to be best near the banks. I picked up my first smallmouth dead drifting a sneaky pete right under over hanging brush. The fishing was slow but we all caught fish or had action every 20 min or so. The sneaky pete was definitely the fly of the trip. In just this one float I caught, rock bass, blue gill, smallmouth and even a river chub. The flow was just fast enough to where I couldn't just sit in the kayak and fish. If I tried to do that I'd drift quickly by where I wanted to cast. I ended up jumping out of the kayak far enough away from where I wanted to cast. The water was low enough to wade in most places. There were some section that allowed me to stay in the kayak and slowly drift. This was my favorite fishing by far. I would drift at a perfect speed near the bank and I could give about 3 good casts before moving on to the next section. This was very productive. I picked off bass or had a hit in every location that looked to hold a fish. There was one scenario that makes me love fishing in general. Sometimes you imagine a situation in your head and it works out exactly like that on the water. I was drifting by a rock cliff and I thought to myself this has to be where a bass is at. I cast where I wanted and almost knew exactly when the fish was going to his. With in 3 seconds the fish was on. I didn't get too many pictures of fish. My camera was in a dry bag and it was a pain getting it in and out. The dry bag paid for itself. After several close calls I managed to keep the boat and everything in it dry. There was a calm section and I saw my friend reach back in his kayak and get a drink. I had a cooler in the back of mine and it wasn't strapped down. I though hmm a drink sounds great, I reached back and the boat shifted the cooler. I reached back even further and the boat went at about a 45degree angle at first I thought there was no way I was going to cap size but then I saw my bag with the camera fall in the WATER! I went in soon after and the boat did in fact capsize. My friend chased my cooler and other belongs having a hard time because he was laughing so hard. I came up refreshed but had a bruised ego. Luckily the cooler floated, the camera stayed dry I got pretty much everything I had but the anchor for the boat. We looked for it for about 5min but couldn't find it. The day light was fading fast another buddy had a leaking pontoon and we had to get to the take out. The take out ended up being a lot further than I expected. Even though I was thoroughly exhausted and hating the river by the time I got to the take out I had a great time. I did a short wade the next day. It wasn't very fruitful. The only fish caught were rock bass. The trip definitely had it's ups and downs. This is what makes trips great. You create memories and stories you can share forever. I look forward to the next one. The Smallmouth trip is only days away and the last few nights have been spent tying what I hope will be irresistible to lunkers. I have yet to catch a smallmouth over 12 inches and this trip is going to be my best opportunity. I bought a new fly box just to house my bass flies. Even though the box is mostly filled I never think I have enough. The last trip I was on had a fish come of on a fly I tied that is a type of zonker pattern. I've varied it some with red eyes and rubber legs. It is an ugly fly. It seems now days when you tie a pattern you need to name it. The only name that comes to mind with this fly is the Boogie Monster. The red eyes have a dual purpose. One to look like eyes and two to maybe fool the fish into thinking the red is a gill plate on a mad tom or fish. I tied the fly in a crawfish and shad pattern as well. I decided to put some rubber legs on the crawfish pattern. On the shad pattern I kept the legs off but added some flash. The fly that I have the biggest expectations for is slowly gaining a reputation among fly fisherman. It's called the Pole Dancer. There's a viral video of it going around youtube and several fishing sites showing fisherman catching huge stripers on the fly. My buddy and I decided to give it a try but with the price tag I'm going to make sure I use about 1x and triple check my knots. The fly does look decent though. I decided to brush up on my smallmouth knowledge by watching Harry Murray's Fly Fishing for Smallmouth. It's a great dvd and he seems like one of the old time members of the fishing club. Some how he makes the movie instructional and entertaining at the same time. I saw a color pattern for one of his clousers and I decided to try tying it myself. Bucktail is pretty pricey for me so my clousers are tied using dust brush material from the $1 store. It does the trick. I tied some other clouser variants including one just out of peacock and flash. I think it actually might work. Overall I think I have a good selection. There are Muskie in the water where we're fishing and I tied a few huge clousers for them. The trip is in a couple days and I can't wait to create some fish stories with my buddies.